Last night I was playing in Photoshop and I wanted to show something different in regards to Animation, I understand that probably you’ve heard that before, but trust me on this one. I can do that in Photoshop! And guess what?! While playing with it it looked cooler than I thought, so in this tutorial I show you the capabilities of animating Layer masks to achieve the same sort of effect. keep in mind that I am just showing you the capabilities of Photoshop, and the concept, if you play a bit more I am pretty sure that you can achive vey cool stuff while animating layer masks. I’ve done previously a tutorial about the new Record Tool in Photoshop CS6 and a lot of people get a bit confused. For a few previous versions of Photoshop that you can record actions, so basically you can record your steps while working on a project, however you couldn’t record a tool itself, like a brush, so in this tutorial I show the difference in Photoshop Cs6 and also a cool way that you can use the new feature in Photoshop CS6. I hope it helps you , and if you have any more queries regarding this subject or others, do not hesitate to leave a comment. Most of you know that I’ve been on hollidays, and for that I needed a decent bag with a good price tag on it. Well, it wasn’t only holidays, as I had to shoot a wedding , therefore I had to take some gear with me, and as I traveled by plain I only could take as hand luggage my laptop and my camera bag so I had to look for a decent bag with lots of space. But a few days before I went away I decided to test the bag and see if I could fit everything I wanted…Well I was shocked! But in a very good way, I could organize the partitions according to my needs and I started putting my gear on the bag, and I managed to put the cameras, lenses, speedlights, with no problem at all, and as my son wanted to take his camera and his video camera I still managed to put on the bag, and also my extension tubes, but why stop there?! There are so many pockets that I nearly got lost, seriously, so many pockets that I managed to put spare batteries, memory card case, remotes, filters, cleaning gear, business cards and on the back of the bag I managed to put a Photoshop magazine that I bought at the airport. But a bag isn’t only about how much stuff you can get on it, it’s also about build quality, and how confortable it is. 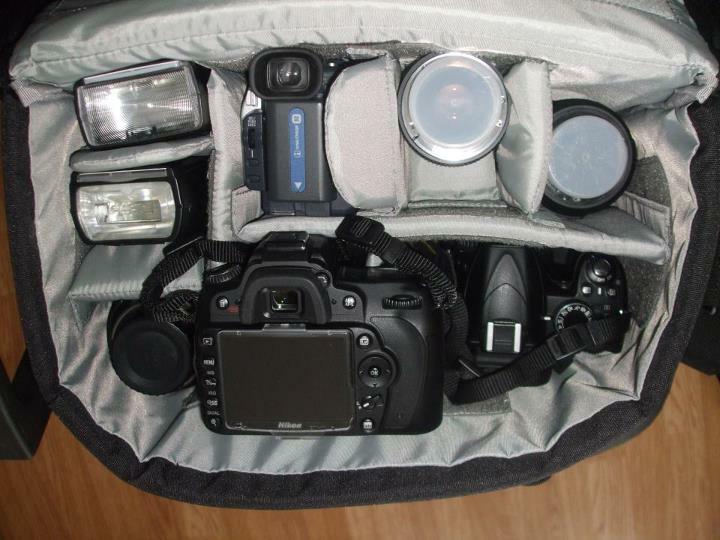 As I like shoulder bags I expect to be easy to reach for a lens or a speedlight but at same time confortable. The Lowepro Nova 200 AW ticks all of those boxes as its very easy to get a lens, unless you have the zipper done, as this bag also has a zipper so your gear is safer, the strap not only is very confortable as also very strong, the bag is also waterproof, and in case that its raining a lot and you are afraid that it may damage your gear, there is a “secret pocket” where you can reach a Full waterproof cover for the bag, and that you still can use the bag with the cover on as it comes in two parts. Well, but will it protect your gear if someone bumps into you in the airport, or in case you drop the bag? It will protect it, the bottom of the bag not only is very thick as its padded, and the bag all around is padded. So, my veredict is, if you are looking for a decent bag with a good price tag, this bag is for you, in a score 1-10 I’ll give it a 12!